Jessica Auer is a documentary-style landscape photographer from Montreal Canada. Drawing inspiration from history and archeology, her work is largely concerned the study of cultural sites. From the beaten track to the frontier, Jessica explores places where history and mythology are woven into the landscape, and where contemporary landscape issues emerge. Taking on the role of observer-participant, her photographs present narratives that incite the viewer to engage with place using their imagination, as well as look at the practice of sightseeing from a critical perspective. Jessica received her MFA in Studio Arts from Concordia University in 2007 and is the recipient of several grants and awards such as the W.B. Bruce European Fine Art Travel Fellowship and the Roloff Beny Prize. Jessica is a co-founder and co-director of Galerie Les Territoires in Montréal and teaches photography at Concordia University. The Newspace Center for Photography is a multidimensional photography resource center and community hub for students, working artists, professional photographers, educators, and photo-enthusiasts of all types. 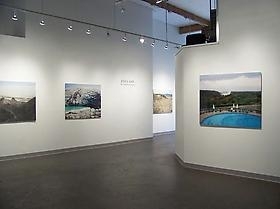 Through a full roster of course offerings, gallery exhibits, digital lab, darkroom and lighting studio access, artists’ lectures, portfolio reviews, an artist residency, and more, Newspace makes a wide spectrum of enriching photographic opportunities available to the Portland Metro communities. Our broad curriculum is made up of beginning, intermediate, and advanced classes. From foundational, technical classes to classes on creative studio lighting, alternative processes, documentary photography, and marketing for the fine-artist, the Center has a regularly evolving variety of educational programming to choose from. In addition to regular programming, Newspace fills a particular niche in supporting the regional nonprofit community by partnering with other organizations to enhance the programming goals of all institutions involved. Newspace has partnered with Washington School for the Deaf, Saturday Academy, Portland Community College, as well as My Story, a photography program for “at-risk” youth.